Some find talking, especially in a public setting, difficult, anxiety-inducing, demanding, and some would even say that they would rather die than speak in front of others. And some don't. Some exude a charm and confidence that capture the full attention of their audience. The secret to the latter group is simply practice. Practice builds muscle memory and confidence. An app that breaks down the fundamentals of speaking into six digestible categories and allows you to practice and receive feedback on one's own. 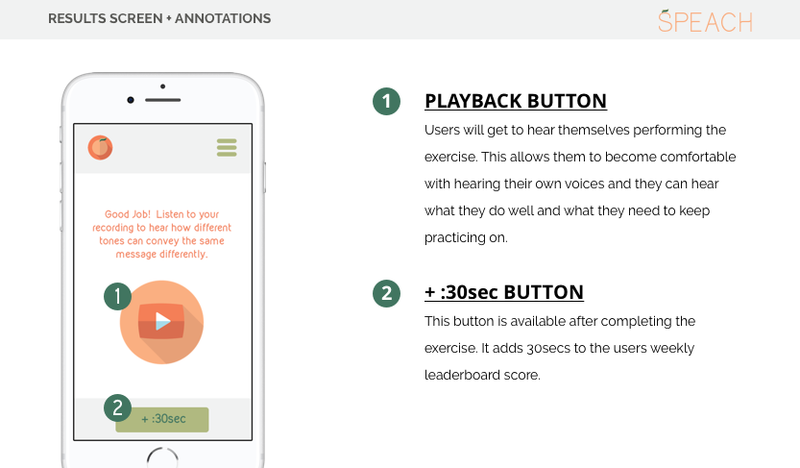 SPEACH is an app that utilizes various exercises that target different aspects of speaking. These include: avoiding the use of thinking sounds/filler words, proper utilization of silences and pauses, controlling speed of which you speak, being aware of the volume of your voice, improving diction, and developing different tones of voices. Each level gradually builds on the previous level in difficulty and in variety of targeted areas. SPEACH encourages daily practice, with the option of setting short term and long term goals. 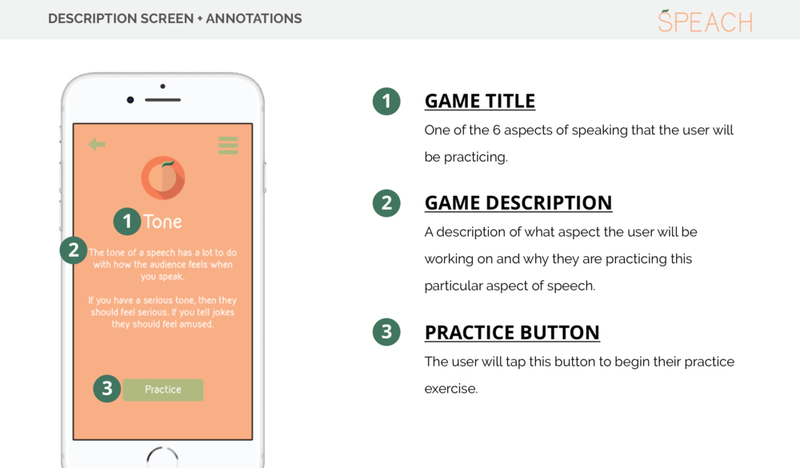 Our users will be able to practice their own speeches by inputting it directly into SPEACH. When coming up with the feature set for SPEACH, we wanted to create an experience that encouraged continued and regular practice. To achieve this, we looked to find human truths that we could leverage to keep ours users coming back to practice. The exercises we wanted our users to practice are singularly-focused on different aspects of speech, but building a strong foundation will give them the knowledge and confidence to get over the fear of speaking in public. Those who want to get better at public speaking tend to avoid situations that will help them do exactly that. They have a fear of putting themselves out in front of others. They lack the formal knowledge of what it takes to be a first-rate speaker. They also lack the experience necessary to understand their shortcomings and what it means to get to that next level. We weren't the first to see that this is a need for people. There are a good deal of other resources (other apps, tutorials, books, classes, inspirational videos, etc.) 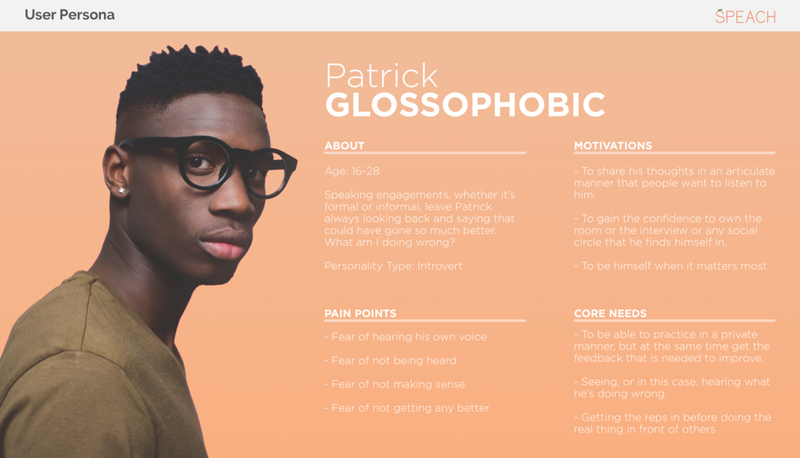 to help people get more comfortable with speaking in public. To differentiate ourselves from them, we gamified SPEACH to encourage continual user participation, we included simple exercises with a rehearsal feature that gives both qualitative and quantitative feedback , and we especially wanted to make sure that our users could practice alone in their comfort zone until they gain the skills and confidence to go speak in public. Public Speaking is like any other skill, to master it you have to practice on a consistent basis. Get your reps in, out of the public eye, then you'll be ready to go when it's time. Lynn and I came up with the concept of turning the different facets of talking into games. Lynn created the iconography, picked the color palette, and chose the typeface with the help of my feedback. I then brought the designs over to Sketch and Principle to bring our idea to life. Lynn and I shot some footage and edited our explainer video in Final Cut Pro.